Modi Govt’s flagship Swachh Bharat Abhiyan has made no provision for waste management while pushing for building more and more toilets. NEW DELHI: They are young foot-soldiers of the Narendra Modi government’s flagship Swachh Bharat Mission, but the daily lives of lakhs of workers who keep our cities clean is a saga of neglect and exploitation. No wonder anger and sorrow rent the air on Sunday in West Delhi’s upscale residential colony of DLF Capital Greens, when an irate crowd gathered to demand justice for the death of their family members, who had died inside the complex while cleaning the sewage treatment tank. The five labourers, namely, Vishal, Umesh, Raja, Pankaj and Sarfaraz, (aged 22-30 years) had entered a sewage treatment plant (STP) in Moti Nagar to clean the septic tanks. Reportedly, Umesh was the first to enter the STP and collapsed shortly, following which the other four rushed to save him and also collapsed. The victims were rushed to a hospital where they were declared dead. It was alleged that the five workers died after inhaling toxic gases. As the news of the death became public, an angry crowd of about 200 people gathered outside the residential colony alleging “inaction by the police personnel”. According to the police, the labourers were not wearing safety equipment while cleaning the tanks. The Delhi government has, meanwhile, order a probe and has a sought a report within three days. Forced to clean the tank? As per reports, the family members and colleagues of the victims alleged that cleaning the septic tank was not the part of their duties. They also wanted answers from the contractor as to why they were made to enter the sewage tank in the first place. The families have alleged that the victims were threatened to clean the tanks else they would be fired from their respective jobs. However, the police have refuted such allegations saying that only one of the victims was the member of the housekeeping staff ,while others had come to save him, as reported by The Hindu. Meanwhile, a case has been registered under IPC Section 304-A (for causing death due to negligence). We have registered a case under IPC Section 304-A (for causing death by negligence) and other relevant sections. It has been found that they were not provided safety belts or masks while being lowered into the tank,” Monika Bhardwaj, DCP (West), was quoted by The Hindu as saying. According to a survey by the Delhi government, the existence of as many as 32 manual scavengers was established mostly in two districts – East and Northeast Delhi. The survey had ruptured the claims made by Municipal Corporation of Delhi (MCD) that had submitted a report in the Delhi High Court claiming that they do not employ manual scavengers. After the survey, it was decided that the Delhi government would be training the 32 identified workers on how to handle the equipment. “The government will provide training to the 32 identified workers to handle machines and equipment for mechanical cleaning of sewers and tanks. A scheme will also be launched on October 2 to provide loans to 200 sanitation workers to help them buy sewer cleaning machines,” Delhi Social Welfare Minister Rajendra Pal Gautam had told Indian Express. However, noticeably, that the figure doesn’t include septic tank cleaners. This raises an important question: Were the 32 workers identified and trained to handle machines? And why were there manual scavengers in the first place when the practice has been obliterated in the country. “Governments have only been promising and giving statements, same is with the current government. What happened yesterday clearly shows there is nothing happening on the ground and they don’t want to improve their condition – the conditions of the untouchables, Dalits,” said Dinesh Abrol, an activist. In another survey, a central government task force recently counted as many as 53,236 manual scavengers in India, which is a four-fold increase as compared to the 13,000 workers accounted in 2017. However, the figures are an “gross under-estimate” as the data is collected only from 121 out of 600 districts. The survey was carried out by the National Safai Karamcharis Finance and Development Corporation (NSKFDC) who were given the task to identify manual scavengers as the government announced to compensate and rehabilitate such workers as per the Prohibition of Employment as Manual Scavengers and their Rehabilitation Act, 2013. The survey is yet to be conducted in Bihar, Jammu and Kashmir, Jharkhand, Karnataka, Telangana and West Bengal. However, various flaws and reports of inefficiency in conducting the survey have been reported from various states. Moreover, the survey excluded cleaning of sewers and septic tanks and scavengers in the Indian Railways, the largest employer of manual scavengers. While manual scavenging was outlawed in 1993, the cleaning of sewers and septic tanks was found perilous only recently as recently as 2013 in the amended Act. 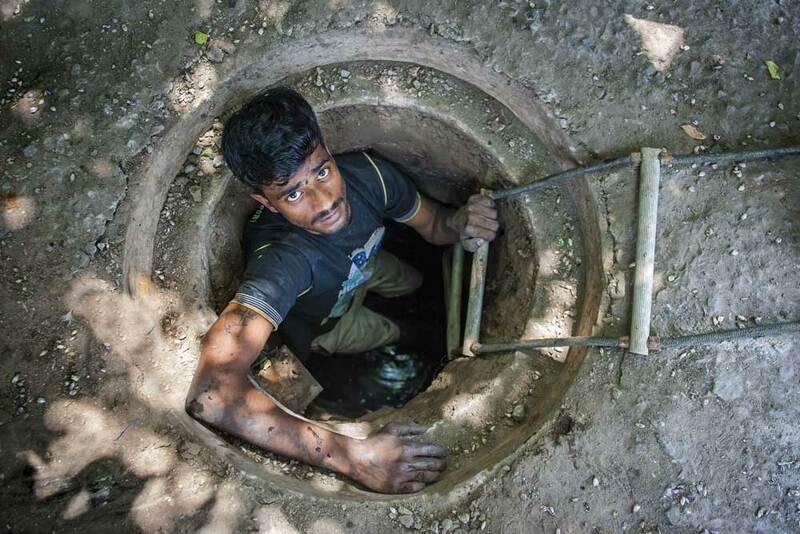 According to the ‘Prohibition of Employment as Manual Scavengers and their Rehabilitation Act, 2013’, the employment of manual scavengers, the manual cleaning of sewers and septic tanks without protective equipment has been prohibited. The Act also sought rehabilitation of manual scavengers by providing them an alternative employment. After repeated attempts, Delhi Social Welfare Minister Gautam was not available for comment. The convenor of Safai Karamchari Andolan, Bezwada Wilson, who was with the family members of the victims, also and is unable to comment. Even after having a law that prohibits manual scavenging, over 300 cases of deaths due to manual scavenging were reported in 2017 from across the country – means almost one sanitation worker a day. According to the figures revealed by Safai Karamchari Andolan, India has 26,00,000 dry laterine cleaners, 7,70,000 sewer cleaners, 36,176 Railway cleaners. As per SKA, 1,760 people have died after inhaling poisonous gases as they enter in the drains and clogged manholes in the past couple of years. Bhasha Singh, an independent journalist and also a member of the SKA believes that the Narendra Modi government’s Swachh Bharat Abhiyan is not focused on eradicating manual scavenging but building more toilets. “In the last four years, the kind of incidents in Delhi and across the country prove the fact that Swachh Bharat Abhiyan is basically about building more toilets. With toilets come more septic tanks and more sewer lines without making any provision to handle the waste. When Swachh Bharat was announced, people thought it would eliminate manual scavenging but the reverse has happened. The incidents and deaths of manual scavengers has increased,” she told Newsclick. “There is no political will to implement supreme court judgment and the new Act. Also, if a toilet is built, I am talking about toilet built in the posh areas like Taj Vivanta and DLF, how is it possible that there is no facility to handle the waste?” she added. As the fourth anniversary of SBA is approaching on October 2, the idea seems to have fallen flat. An article by The Wire found that the rehabilitation of manual scavengers carried out under Ministry of Social Justice and Empowerment’s ‘Self Employment for Rehabilitation of Manual Scavengers (SRMS)’ scheme hasn’t received any funds from the current government. Recently, in a reply to an RTI filed by The Wire, it was revealed that not a single penny had been released by the current government for the rehabilitation of manual scavengers until September, 2, 2017. As per the report, a total of Rs 226 crore under this scheme was released since 2006-07 – before the financial year 2013-14. No further funds have been released by the Modi government, which has spent crores to advertise the SBA as one of its key achievements.